The Rome Masters Series event arrives hot on the heels of the Madrid Masters and provides an opportunity for a clay double, as Djokovic did in 2011. 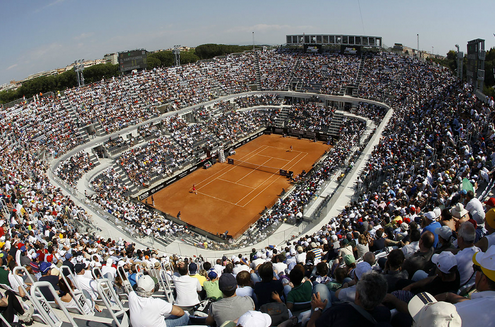 The courts in Rome are slower than Madrid and the crowd is right on top of the players, like a coliseum. Italians in the draw will get plenty of home support and there will at least be one Italian in the 2nd round as Andreas Seppi squares off against Fabio Fognini in round 1 with the winner a daunting encounter with Nadal in round 2. Italian wildcards go to veteran Potito Starace, Paolo Lorenzi, Filippo Volandri and Matteo Viola. Masters series draws are never easy, but the hardest quarter falls to Djokovic with the red hot Wawrinka and Berdych in there. No real obstacles in Nadal’s path, while Murray needs to prove he can be a factor on clay. Federer is suspect now, but will get some match practice in at least. Defending Champion: Rafael Nadal – The Bull had reached the final in all six of his events played this year, winning four titles. He is chasing his 40th clay-court trophy. Floater: Juan ‘Pico’ Monaco – In a quarter where there is little to separate them and could come through. Veteran Watch: Tommy ‘The Hitman’ Haas – Could get Federer in the 3rd round and could quite possibly be the favorite. Youngblood: Grigor ‘Baby-Fed’ Dimitrov – We’ve seen in his win over Djokovic, that the 21 yr old Bulgar has arrived. Nestled in the draw like a land-mine. Slumping: Marin Cilic – Not a dirt-baller by any means, but he needs to at least live up to his seeding. On Fire: Stan ‘The Man’ Wawrinka – A confidence boosting title in Portugal set the stage for a run in Madrid. That backhand is smoking. Notable Wildcards: Filippo Volandri – A class act on clay and still enough of a threat for Gilles Simon to take seriously. My pick: Rafael Nadal – Gotta do it. He’s grooving, and his closest rival on the dirt Djokovic, is not. Did You Know? Rome is one of the few ATP World Tour Masters 1000 titles that Roger Federer hasn’t won. Thanks for reading and check back next week for more!